Penang Lok Bak is one of those dishes which had intrigued me for the longest time. Being in Singapore, we are more accustomed to the cuisine and cooking styles of the southern Peranakans at home and in Melaka. I practically grew up eating chap chye, kari ayam and ngoh hiang. My grandma, together with my aunts and my mother would whip up a whole table full of mouth-watering dishes whenever there is a family gathering and these three dishes would definitely make their dutiful appearance on the dining table. Sometimes one, sometimes two and if we are lucky, all three! So a large part of my growing up experience is made up of “food memories”, from eating to observing and finally to cooking. When I first came across the term “Penang Lor Bak” a couple of years back, I had thought that it would be rather similar to the Tau Yew Bak which was frequently cooked at home as well. But prima facie, it looked no different from the ngoh hiang which I’m familiar with! Utterly confused, I took my first bite and received an even greater shock, only to realise that despite the somewhat familiar flavours, the textural profile was utterly different from ngoh hiang! And to make things “worse”, I actually liked it! Penang lor bak defers from ngoh hiang in several ways. 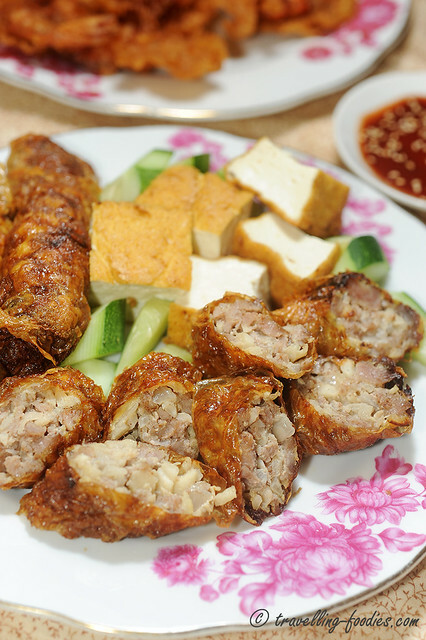 Firstly, whole strips of pork loin were used in place of minced meat in ngoh hiang. This gave the meat rolls a lot more bite and to me, more interesting in some sense. For the version I had, bangkwang, also known as yambean or jicama was added in addition to the customary water chestnuts, imparting not only crunch, but a wonderful sweetness from the root vegetable. 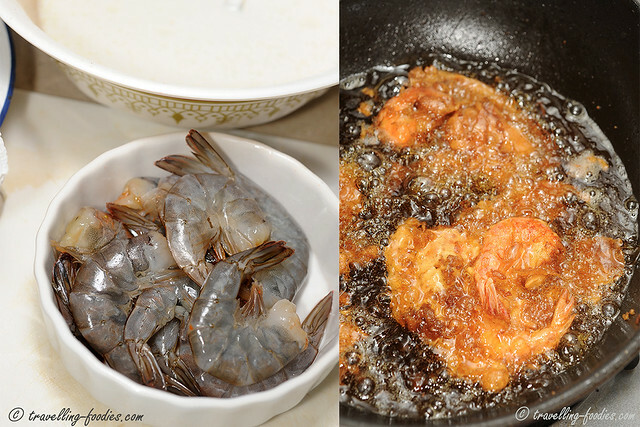 The other notable difference is… where are the udang?! Well, one could say that the dish is robbed of the umami flavours of seafood, but I really didn’t mind actually as I had never been a big fan of prawns anyway. One thing remains common between these two Northern and Southern varieties of the same dish, rich and robust flavours and aroma from the wonderful use of “ngoh hiang hoon” aka “five-spice powder”. This is not uniquely Peranakan of course, as its origins can be traced back to Hokkien influence. And this constitutes the “Lor” component of the dish in Penang lor bak, as this unique blend of milled spices, together with use of good soya sauce is an indispensible condiment for meat braising, particularly amongst the Chinese cuisines along the southeastern coastal regions. If using bangkwang, first place the cut strips in a large mixing bowl and add 1 tsp salt. Mix around thoroughly and leave to stand for 15-20 min. This is to allow osomosis to occur for excess moisture from the bangkwang to be removed. After leaving to stand, gently squeeze excess moisture and discard juices. 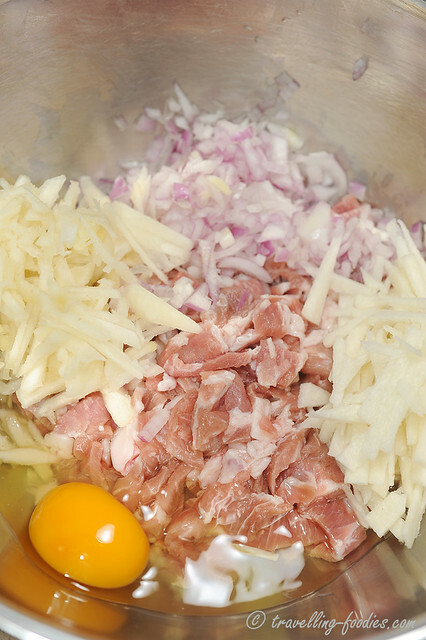 To the same mixing bowl, add all the remaining ingredients with those for the marinade. Mix well and set aside for at least 2 hours in the fridge, preferably overnight. Cut beancurd skin into rectangular pieces, each appro. 15 x 20 cm long. This is easily done by following the creased “folding seams” of the folded tau peoy in the packets as they are being sold. Wipe each piece rapidly with a slightly dampen kitchen towel or cloth to remove excess salt and oil. Lay a piece of tau poey flat on a surface and place appro. 2 tbsp of filling in a tubular shape near one end of it, leaving a small recess around the perimeters (see photo). 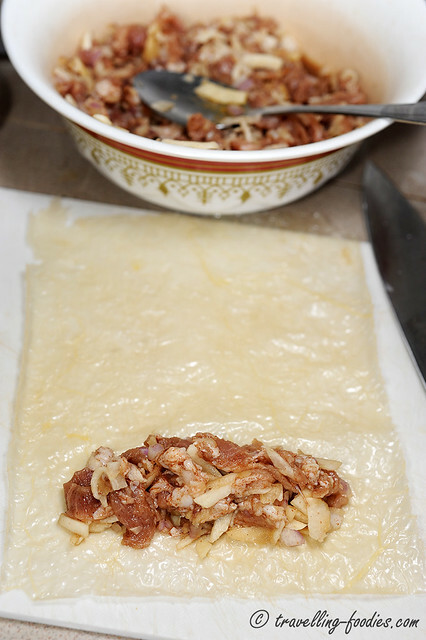 Fold the two longer sides over the filling and quickly proceed to roll the shorter end facing you over the filling as well, in the direction away from you. A little tension needs to be exerted to make sure that the filling is tightly wrapped, without breaking the beancurd skin. 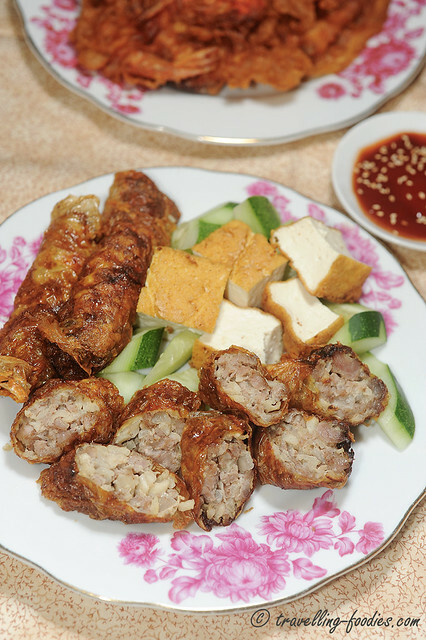 The beancurd skin should be rolled over the filling 2-3 times but no more than that. Excess skin not only affects the textures, it also makes the rolls too salty. Thus, trim any excess skin with a sharp knife. Dab a bit of the starchy paste from the marinate on your finger and run it along the remaining exposed end of the beancurd skin. Finally, roll over and seal tightly. Set aside with the sealed edge facing down, using the weight of the filling to keep the meat rolls sealed and intact. 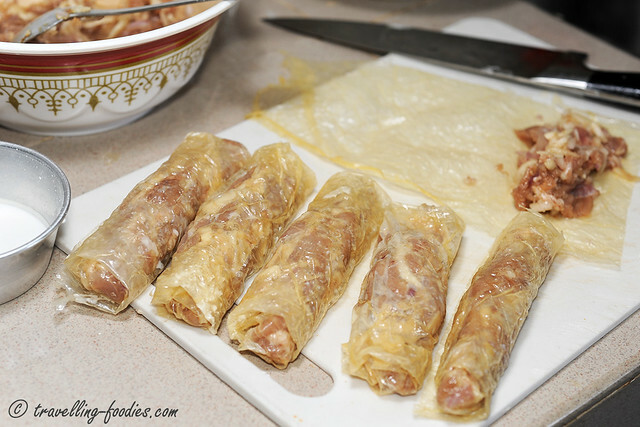 Repeat with the remaining pieces of tau poey and filling until ingredients are used up. To deep fry, add oil to a heated wok over medium flame. Test with a pair of wooden chopsticks or alternatively, place a small piece of excess tau poey into the oil. The oil is sufficiently hot when small bubbles begin to form along the edges of the tau poey rapidly and the tau poey floats up to the surface. Slowly lower the meat rolls by sliding them into the oil with the sealed edge facing downwards. Divide and deep fry in two or more batches to prevent overcrowding. Turn periodically to ensure even coloration on both sides but be very careful not to break the skin. When the skin develops a light tan hue, remove the meat rolls from the oil and drain over a wired sieve or colander. Repeat the deep frying with other batches. Finally, turn up the flame to medium-high and return the rolls into the oil the second time. This helps to purge out any oils within the rolls and crisp up the skin slightly. Remove the meat rolls when they turn brown. It should take no more than 15-20 seconds. Do not overdo this the skin may char and burn, leaving a bitter aftertaste. Drain over wire sieve or colander first and then over kitchen towel to absorb and remove excess oil. After the rolls have cooled down slightly, Cut and serve with, sliced cucumbers, deep fried tau kwa (firm beancurd), poh piah chnee (deep fried spring rolls), heh piah chnee (deep fried prawn fritters) or deep fried fish balls. A word of advice, prepare one meat roll first and deep fry it. Use it as a guinea pig and sample the roll after it had cooled down sufficiently. Adjust the seasoning of the filling if necessary for the subsequent rolls. Wrapped meat rolls ready to be deep fried. The skin should not be too thick as it would affect both the texture and taste of the rolls as the skin is very salty. 2-3 turns around the filling should be sufficient as seen above, the filling should still be vaguely visible. To make the Chili Dip Sauce, simply mix chili sauce and tomato ketchup in a small bowl and sprinkle with chopped tor tau thng and toasted sesame seeds. If tor tau thng is not available, it can be replaced with a tsp of fine grain sugar and 1 tbsp of powdered peanut. Otherwise, it can be omitted entirely. 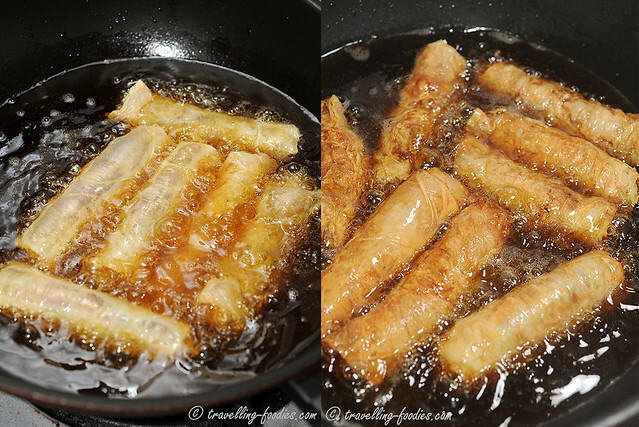 Two-step deep-frying, first to cook the filling (left) and then to darken and crisp up the skin (right). To make Lor Sauce, simply put all the ingredients except egg white and starch mixture in a small saucepot over a small flame. Warm gently to dissolve sugar. Thicken with starch mixture and finally add egg white over mixture and stir gently to form streaks. At all times, the mixture should be warmed but never brought to a point of boiling. Adjust taste with salt. Made Heh Piah Chnee to go with the lor bak as well! After all this talk of Penang lor bak, Melakan Peranakan foodies must be lamenting at my “betrayal” and crying “traitor!” by now. Am I a convert? Hell No! I still love Grandma’s ngoh hiang to bits, and remember it fondly. I may be biased, but it is undoubtedly the best I’d ever had so far. But what Penang lor bak has given me, is the wonderful opportunity of “possibilities”, and it is this window of “possibilities” which I more than welcome and embrace. This entry was posted on June 7, 2013 by Alan (travellingfoodies). 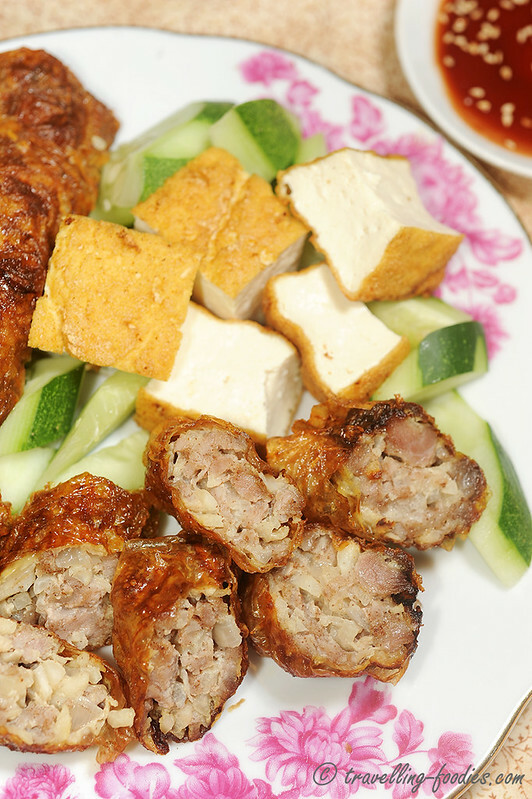 It was filed under Food, Simple Eats and was tagged with cucumber, deep fried, 虾饼, firm beancurd, heh pheah chee, lor bak, meat rolls, ngoh hiang, Penang, Penang Lor Bak, poh pheah chee, poh piah, pork loin, Pulau Penang, tau kwa, water chestnuts, yambean, 槟城, 槟城香炸滷肉卷, 五香. Hi Alan , Oh i just realise how long it has been since i have eaten this dish . And how i miss all the Penang food that you have share over the last few days. Hi Ruth 🙂 Hopefully this served as a good reminder for you to go try some Penang food this weekend! Better still, make some yourself! Not tough, I assure you! Interestingly I have not seen ngoh hiang served with Lor in Singapore. yes you are right, Dr Ong. the Ngoh Hiang Heh Piah stalls at the food centres in Singapore usually just serve the food with chili and this starchy sauce which is usually pink or orange, and sweet and savory at the same time! Thanks for the tip on the Lor Bak stalls in Penang! Will definitely visit and try when I am there the next time! omg that picture of the prawn cracker makes me salivate! been some time since I was able to gobble those up! i need to get the spices. Do you know where can i get them? Where are you located Joella? If you are in Singapore or Malaysia, any supermarket should carry these spices.